The creation of 3D character animation is underpinned by the expertise in animation software, movement and creative screen techniques. With these varied foundations, the intricacies of the production process are challenging for an animator to communicate beyond the animation department. By leveraging agent-oriented modelling (AOM) techniques, used to design and visualise autonomous software systems, the technical and creative attributes of a common computer animation process have been visualised in the agent-oriented Mark I process model. This paper builds upon the Mark I process model with the exploration of two emerging AOM concepts (known as the primary goal and the emotional goal) and looks at how these modelling concepts can be used to identify significant production activities and character qualities throughout the model. After introducing the fundamental concepts of AOM, the goals are applied to the Mark I process model. The result of their implementation is a much slenderer and more direct Mark II process model. Discoveries made through the exploration of these emerging modelling concepts offer novel approaches towards simplifying the communication of complex production activities and expectations, while also expanding the use of AOM to communicate related screen practices and processes. The process for creating computer animation typically follows a high-level filmmaking framework of pre-production, production and post-production processes. These processes contain similar activities and intentions to their live-action counterparts, and are usually described in terms of broad activity and outcomes (Kerlow 2009, 77). For example, the animation production process may be described as ‘the animation department bringing characters to life’ (Parent et al. 2009, 22). How the animation department, and more specifically the animator, does this is a little more challenging to specify. A typical 3D character animator’s production activities and expectations are often specific to the animation software packages s/he is using, but also his/her own awareness of cinematography, movement and narrative techniques (Selby 2013, 148). Acclaimed character animators Richard Williams and Emery Hawkins capture the key difficulty in expressing how an animator brings a character or object to life (Williams 2001, 10). Williams: ‘I’m afraid my brains are in my hands’. Hawkins: ‘Where else would they be? It’s a language of drawing. Although the language of animation may be highly visual, it is not uncommon for character animators to document their processes in text. Such processes tend to be largely focused on activity, or quality (Schleifer 2011), with the two perspectives rarely meeting in the middle to convey the how in a comprehensive and common language mode of delivery. The explicit modelling methods associated with agent-oriented modelling (AOM) have been recently leveraged to visualise both perspectives within an agent-based model of a 3D character animation production process (Murdoch, forthcoming). The visualisation or ‘modelling’ of this process was approached through a ‘requirements’ lens, seeing common production activities, processes and notions of quality communicated through simple, but explicit functional and non-functional requirements, that were later compiled into a graphical process model. An investigation of this process model in a live environment demonstrates the potential of AOM to inform and guide an animator’s process; however it also highlights concerns around the clarity and weighting of key production activities and their qualities. In an attempt to address these concerns, two emerging AOM concepts; the primary goal and the emotional goal, are discussed as process modelling concepts. After this, they are applied to the Mark I process model, where their potential to clarify the intent and weighting of activities, and to differentiate between notions of quality is explored within a new Mark II iteration of the process model. 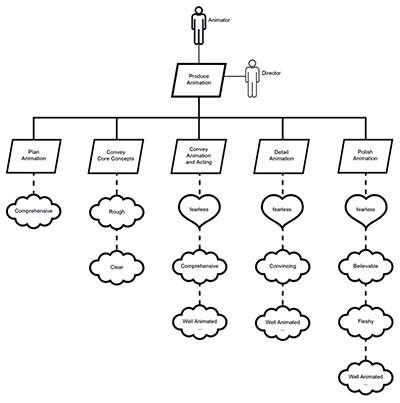 Agent-oriented modelling has recently emerged from the field of software engineering, where it is commonly used to visualise software systems and projects (Sterling and Taveter 2009). Despite its deep technological and computer science roots, the methodology advocates the use of simple language to convey specialist knowledge, activity and the interactions of human or artificially intelligent agents. It promotes multiple modelling methods to convey different types and depths of information to project stakeholders. Perhaps the most interesting and appropriate modelling method for the more ‘creative’ disciplines is agent-oriented goal modelling (AOGM). This modelling method recognises projects as having distinct layers of development, and that each layer, or ‘environment’, may bring different domains of expertise together to achieve one or more goals. These environments are visualised within a multi-layered conceptual space. The conceptual space is composed of three distinct modelling layers or ‘environments’. Each environment is designed to model different perspectives and appropriate levels of detail to all project stakeholders. The motivation environment sits at the top of the conceptual space, and is used to model a project’s high-level goals, domain knowledge and key stakeholders. For example, the project may have a goal to make a film. Achieving this may require domain knowledge of writing, directing, producing, financing and distribution. The mid-level system design environment models processes that are designed to achieve the motivation environment’s goals, and does this by identifying activities, the order in which they should be performed, and what kind of role (agent) is required to perform them. For example, the filmmaking process may be to first write a script, which will require the engagement of a writer, then to pre-visualise the story, which will require a story artist, and then to shoot the story, which require various film crew roles. The final deployment environment sees the activities and agents from the system design environment broken down into concrete actions and concrete agents. For example, the earlier activity of pre-visualise story and the role of story artist, may be expanded into specific actions and agents, such as assigning the story artist Amelia to the activity draw storyboards. The next action may be to compose a 2D story reel, which will be performed by the story editor Eliza, which can then be sent to fellow story artist Gillian, who will pre-visualise the story using 3D animation. The core notions of agency and requirements form the backbone of the conceptual space, and facilitate the creation of environment-appropriate modelling concepts. The relationship of these core notions to the three modelling environments and their concepts is important, and must be considered when introducing new requirements into modelling practice. Figure 1: The relationships of agency and requirements to different modelling concepts within the conceptual space. 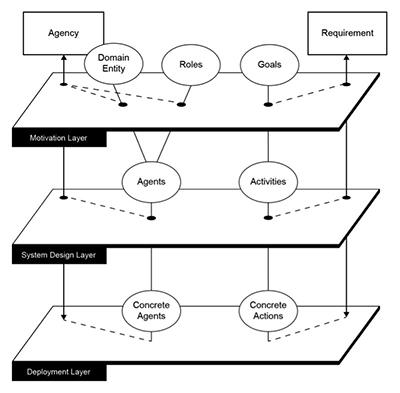 Figure 1 shows the notion of agency running throughout the three conceptual environments (layers) and how it links to different modelling concepts that concern intelligence. At the highest level, intelligence is represented through domain entities and roles that are required within that environment. In reality, the domain entity may be Charlie, who brings a wealth of animation experience and process knowledge to the project. In this environment, he may perform the higher-level role of an animation director, and/or animation consultant. As the project advances into the system design environment, intelligence refers to the agent concept. In this environment, an agent performs a role within a process, and could see Charlie be associated with the role of animator. In the deployment environment, the agent role is filled by a concrete agent, who will then perform concrete actions. This may see Charlie, or another animator, assume the real world position of animator, assistant animator, or lead animator for example. The core notion of requirements also runs throughout the conceptual space, and facilitates the modelling of tangible activities and expectations. At the highest level the notion supports the identification of key project requirements or goals. In reference to the earlier example, the goal may be to make a film. Within the system design environment, goals are broken down into system requirements and referred to as ‘activities’, such as the filmmaking process, which will be composed within a process model. In the final deployment environment, activities are expanded into concrete requirements, and are the concrete actions an agent performs. The AOGMs discussed throughout this paper are concerned with process, and are thus situated within the conceptual space’s system design environment. To summarise this environment, the agent concept is used to describe a type of intelligent entity such as an animator, and links that entity to knowledge-appropriate activities which are required to be completed as part of the production process. These concepts and their relationships are visualised through three common modelling concepts. The three key modelling concepts, shown in Figure 2, are used to convey notions of agency and requirements throughout all three conceptual space environments. To make working with requirements more palatable (particularly for creative disciplines), they are separated into functional and non-functional requirements, or ‘modelling concepts’. Figure 2: The three key modelling concepts used within AOGM practices. Within the system design environment the agent concept is used to identify a type of intelligent, thinking entity that is capable of performing knowledge appropriate activities, and could be human or artificial intelligence. Functional requirements are the tangible activities that an agent will do within a process, and are represented via a parallelogram icon. Functional requirements are evaluated as being either complete or incomplete; and can be simplified as activities or ‘do’ requirements. Non-functional requirements are considered as attributes of activity, and are used to convey how an activity, or the outcome of an activity, ‘should be’ and are commonly referred to as quality attributes. The subjective or ‘soft’ nature of quality attributes see them symbolised via the ‘fluffy cloud’ icon. Figure 3: An example of the modelling concepts in practice, where the animator will animate a character that is expected to be believable. Figure 3 shows an example where the agent type animator has been assigned to perform the activity animate character. This activity can be evidenced through an animated character outcome, rendering it complete. The animated character is also expected to be believable, which is conveyed through the activity’s quality attribute. However the achievement of this desirable quality is subjective. The development of the Mark I process model considered professional practices, expectations and processes common to the production of 3D character animation and conveyed these using agent, activity and quality modelling concepts. 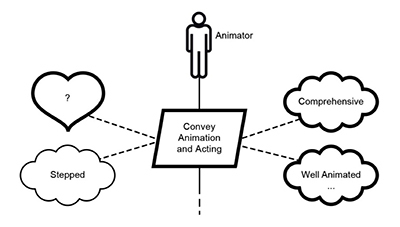 In this process model, the agent concept is exclusively used to represent the animator as the entity responsible for performing all of the process’s activities. The concept is not used to symbolize the animated character or notions of its agency. Such notions were sought to be realised through the achievement of the process’s activities and their quality attributes. The activity concept is used to express two types of activity normally performed by animators. The first focuses on creative activities with a tangible outcome, such as the planning of movement via sketched drawings, or the key framing of a character’s poses. The second looks at more rigid activities, such as those imposed by software and tool functionality. These activities are often scaffolding, and determine the sequencing of activities which resemble a typical studio approach to the creation of 3D character animation (Luhta and Roy 2014, 174-201). Figure 4: The top level of the Mk I model, showing the six key activities and their sequencing within the production process. Figure 4 shows the pinnacle of the Mark I process model, and identifies the animator as being responsible for performing the main activity animate shot. The animator is also responsible for performing all the animate shot child or ‘milestone’ activities which, when read from left to right, convey the process’s sequence. By leveraging a parent/child hierarchy, a milestone activity can be expanded and contracted to reveal different depths in the process model. When expanded, a milestone activity will reveal a depth of milestone specific activity and attributes, and is referred to as a milestone model. As a way of keeping AOGM language simple, only one notation for describing quality attributes is promoted (the fluffy cloud icon). 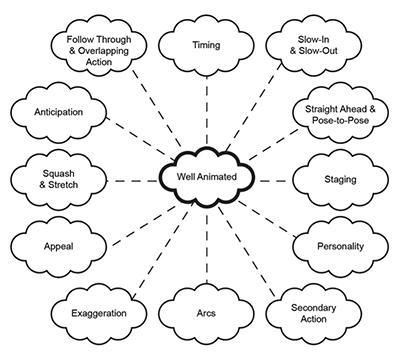 In the Mark I process model, the fluffy cloud icon is used to convey expectations from three broad categories of quality which were specific to the animator’s activity, and the anthropomorphic ‘human’ qualities of the character being animated. The first category refers to notions of creativity, such as directorial and storytelling virtues that can be linked to the character’s placement, action and performance. The second category looks at artistic quality, and includes expectations relating to the animator’s application of tools and technique. The third category concerns acting quality, and draws on both creative and artistic categories to define attributes pertaining to the character’s acting and emotion. In the Mark I process model qualities from one or more of these categories are commonly used to describe how activities should be. For example, the activity create key poses is a foundational activity within the process, and will see the creation of a character’s significant poses. These poses should support the narrative (creative quality); the character should be posed and articulated appropriately for the action (artistic quality); and the character’s personality should also be obvious (acting quality). The Mark I process model identifies 76 activities for the animator to perform and 195 quality attributes to be considered throughout the production process. The Mark I process model was deployed and explored within a live production setting, where it was found to be a comprehensive and practical visualisation of the production process. However, this exploration also highlighted some of the model’s weaknesses, such as how the volume of activities created a lack of clarity around their collective intent, the unknown weighting or importance of particular activities, and that different notions of quality were not distinct enough from one another. ‘A computer game must be engaging enough that people will play it. Making a game that is fun trumps other system requirements, irrespective of whether the goal of fun is clearly definable or measurable. If no one wants to play the game, no matter how robust the code is, it has not met the primary system requirement’ (2014, 45). The same, or similar, could easily be said for film, television and animation outcomes. Marshall’s prioritising of emotion over notions of form and function echo great, emotionally oriented design philosophies (TechGuy 2013), and certainly align with the view of the animator as actor (Thomas and Johnston 1995, 473-475). His emotion-first approach to modelling may have potential for increasing the awareness of key attributes with agent-based models, particularly those relating to an animated character’s human qualities. The emotional goal ‘aims to affect a person’s emotional state or wellbeing’ (Marshall 2014, 45). To differentiate this new type of modelling concept from the existing quality goal and functional goal concepts, Marshall proposes the emotional goal be conveyed via a heart icon, and be thought of as a ‘feeling’ goal, as compared to a ‘being’ goal (quality attribute) and a ‘doing’ goal (activity). Since its introduction, the emotional goal has gained interest within the AOM community, where it has been used to identify how agents/user groups should feel when interacting with a project outcome (Miller et al. 2014). The concept has also been reversed to identify emotions which are to be avoided, and have been modelled using an upside down heart icon referred to as a negative emotional goal (Lopez-Lorca et al. 2014). However, these emotional concepts have only been discussed within the context of the conceptual space’s motivation environment, and have not yet been explored as modelling concepts within the process-focused, system design environment. The system design environment considers notions of quality to be an attribute of activity, or more simply quality attributes. By extending this view to notions of emotion, it can be argued that the higher-level emotional goal can be interpreted as an emotional requirement and then simplified as an emotional attribute within the system design environment. To define the emotional requirement within this environment, I refer to Sterling and Taveter (2009, 344) who view a quality attribute as being ‘any requirement about the quality of the software as opposed to its functionality’. For consistency, I describe the emotional attribute as being any requirement about the emotional quality of an activity, as opposed to its functionality. As an attribute of activity, it is foreseeable that an emotional attribute could be used to convey the emotional state of the agent performing an activity (the animator), an agent responding to the outcome of the activity (the audience), or even the emotional state of a character (the outcome of the animator’s activity). I find the latter more interesting and appropriate to the process model. With this in mind, I offer an alternative definition whereby an emotional attribute can be any requirement concerning the emotional state of a character, as opposed to the emotional reaction of external agency. Figure 5: The ‘poison apple’ scene from Snow White and the Seven Dwarfs (1937) should see the evil Queen and the audience having two different emotional states. Consider this character-centric definition in a scenario where, in order to create an opposite audience reaction, it may be a director’s intention to have an animated character express delight. 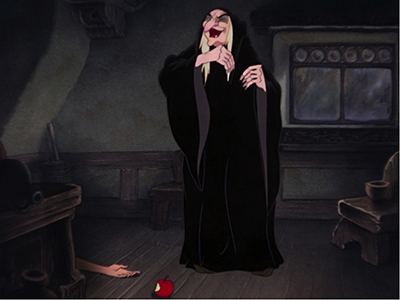 For example, the evil Queen in the ‘poison apple’ scene from Snow White and the Seven Dwarfs (Hand et al. 1937). The Queen, disguised as an ugly hag, may be delighted at Snow White’s poisoning, but this does not mean the audience (external agency) is also delighted. Depending on the mechanics of the story, what the character is actually delighted about, and which character’s story an audience member is engaged with, will determine if they may feel frightened or disgusted, rather than delighted. Thus, having the ability to explicitly identify an animated character’s emotional state is an important part of the character animation production process. The ability to differentiate between the three quality categories described earlier (creative, artistic and acting quality), is evidently more promising with notions of emotion falling into the category of acting quality. At the core of this category is the idea of thinking, and sees the category’s modelling concepts contribute to the exhibition of the character’s thought process. ‘Everything, including emotion, begins and ends with the thinking brain’ (Hooks 2013, 14). Hooks sees thinking as the root of all action and as driving character performance and emotion, and thus acting quality a fitting category to be conveyed via the emotional attribute. I propose that for acting expectations to be made more distinct from creative and artistic expectations they be explicitly modelled through the emotional attribute. However, the scope of acting quality should be narrowed to convey only an emotional state, leaving the standard quality attribute to convey other notions that may also fall within the zone of acting quality. To do this, I borrow and adjust Marshall’s approach for composing higher-level emotional goals where he states the user should feel [emotion], and propose that a character-centric emotional attribute be determined by stating the character is feeling [emotion]. The resulting emotion or emotional state could then be clearly labelled within the heart icon, and attached to an activity. The other concept emerging from Marshall’s work is the primary goal, which aims to draw attention to significant, high-level project goals. It is foreseeable that any agent, activity or attribute may be promoted to primary status, regardless of its hierarchical position within a model. However, the author of the model (and/or key stakeholders) should ensure that any potential primary concept is of significant importance to the process, or they risk diminishing the primary status. Figure 6 shows the four main AOGM modelling concepts with a normal and primary status. The concept’s primary status is identified by a heavier weighted outline, which sees it stand out in a model. Figure 6: The primary status of modelling concepts is identified by a heavier weighted outline. Like the emotional goal, the primary goal originated within the conceptual space’s motivation environment, and also requires transitioning into the process-focused system design environment before it can be considered a usable modelling concept. Given the clear intention behind the primary goal is identifying significance, the only consideration for its transition should be the terminology used to describe it. When moving from the motivation environment into the system design environment, goals are transitioned into requirements that are then made more explicit as activities, quality attributes and now emotional attributes. To keep the modelling concepts simple and consistent, I propose that primary concepts within this environment be prefixed with the word primary, for example; primary activity, primary quality and primary emotion. From a practical modelling stance, the primary concept enables clear identification and the weighting of key activities (or important attributes) above others. In reference to Marshall’s computer game example, it may also be appropriate for primary concepts to be used as a vehicle in which to elevate quality attributes above an activity. In addition, the primary concept could also be leveraged to merge related modelling concepts and clarify their collective intentions. This may see a reduction of activities and or attributes within models. 1. When labelling concept, favour language which promotes intent. 2. Elevate significant activities and attributes as primary concepts. 3. Use the emotional attribute to convey acting qualities. 4. Consider clustering activity to convey collective intent. The application of these new guidelines and modelling concepts was flagged as a Mark II iteration of the process model. Using the Mark I model as a starting point, a top down approach was employed, seeing milestone activities reviewed and amended before moving into their underpinning activities and attributes. The top-most level of the production model underwent significant change with the introduction of the primary concept. By exploring its ability to merge activities, a major structural change was made to the process, seeing the two similar activities (layout animation, and block foundation animation) merged under a common milestone activity labelled convey core concepts. In an attempt to better explain the intended outcome of the milestone activity enhance foundation animation, it was renamed convey animation and acting. To further clarify the overall process and its expectations, all primary attributes linked to milestone activities were included in this top-level production model. Finally, primary status was given to the animator agent but not the director agent, who will interact with the process, but in a more secondary role. Figure 7 shows the complete top-level production model, the equivalent Mark I model was featured in Figure 4. Figure 7: The top level Mk II process model now has five core activities and clearly defined expectations associated with their achievements. The production model now promotes five core activities in sequence from left to right, as well as the expectations of each. With important attributes now included within this top-level model, it should be much easier to convey the expectations surrounding each major activity, and show how expectations of quality increase as the process advances. The model’s first emotional attribute is introduced within the plan animation milestone as a non-primary standard attribute, and transitions into a primary attribute when attempting to achieve the process’s third milestone activity convey animation and acting, highlighting the importance and quality of the character’s exhibited emotional state. This emotional attribute then continues, along with the well animated attribute (an artistic quality encapsulating the twelve principles of animation) as primary attributes throughout the remainder of the process model. Both of these attributes are pivotal to the overall process and, as such, are duplicated to ensure the character’s performance and technical qualities are continually being considered and evaluated by the animator as the process edges towards completion. One of the most impactful updates throughout the model can be attributed to a rather non-standard, and unexpected, application of the primary concept. In the Mark I process model the principles of animation as applied to computer animation (Lasseter 1987) were conveyed as individual quality attributes, and they appeared throughout the majority of milestone models. Although these individual attributes were appropriate for conveying a comprehensive process, they were also a major contributor to the model’s large, and somewhat confronting volume of attributes. By identifying the significance of animation principles to the animation process, the primary concept was leveraged to create a new quality attribute which described the collective purpose of these principles, which was to create well animated characters. Using an unorthodox modelling practice, the attribute’s label was suffixed with ‘…’ (Figure 8) which aimed to signify that the attribute can be expanded/is linked to a standalone model of the same name (Figure 9). Figure 8: The well animation attribute and its suffix are shown within a high level snippet of the milestone activity convey animation and acting. Figure 9: The principles of computer animation promoted within the standalone well animated attribute model. This approach saw a significant reduction in the number of quality attributes promoted throughout the process model. With one common model now housing these specific artistic qualities, it is anticipated that there will be greater clarity surrounding artistic expectations and that the meaning of ‘well animated’ will increase for the process’s agents and be more consistent throughout the broader process model. Implementation of the new guidelines and modelling concepts saw the process model undergo significant change (and hopefully improvement) from the Mark I model. To summarise updates made through the Mark II model, all milestone activities were promoted to primary status, and unlike the Mark I model, these milestones now had primary quality and emotional attributes linked to them. With primary attributes now carrying more weight, and with the introduction of the expandable well animated attribute, many of the lower level or localised attributes were no longer needed, seeing a significant reduction in their overall volume. The emotional attribute was also sparingly embedded throughout the process model, and provided a way to clearly identify a character’s desired emotional state throughout the process. By emphasising the relationships of individual activities to higher-level activity and their attributes, the structures of the milestone models were recomposed from being reasonably flat, to a more tree-like parent/child hierarchy. The Mark II process model has introduced 18 primary concepts, and four emotional attributes. It also features a slight reduction in activities from 76 to 61, with a more noticeable reduction in quality attributes from 195 to just 22. With these amendments, the new model appears to have still retained a strong practical structure and focus, while also seeing its appearance and the communication of activities and expectations simplified. The introduction of the primary goal and the emotional goal within the process-focused system design environment has demonstrated the joint potential of these two emerging concepts to clarify key intentions and different types of quality within large, requirement-heavy process models. More specifically, exploration of the primary goal has highlighted new avenues that can be taken to clearly convey requirement weighting and intent within agent-based process models. It has also shown that the primary goal can be leveraged to simplify requirements through their clustering and consolidation. Likewise, exploration of the emotional goal has expanded modelling possibilities within the system design environment by providing the ability to clearly convey acting qualities as different to creative and artistic qualities. This concept has also provided a means by which to convey character specific emotions within the production process, It has great potential to be expanded across other mediums and processes where the emotional state of internal and/or external entities require visualisation. The next step in this exploration of AOM is to consider how these new concepts, and the iteration of the process model may be used by the animator when performing and evaluating their activities in a live production environment. Hand, David, William Cottrell, Wilfred Jackson, Larry Morey, Perce Pearce and Ben Sharpsteen. 1937. Snow White and the Seven Dwarfs. [Movie] Burbank, CA: Walt Disney Productions. Hooks, Ed. 2013. Acting for Animators. Hoboken: Taylor and Francis. Kerlow, Isaac Victor. 2009. The Art of 3-D Computer Animation and Effects. 4th ed. Hoboken, NJ: John Wiley & Sons. Lasseter, John. 1987. “Principles of Traditional Animation Applied to 3D Computer Animation”. SIGGRAPH Comput. Graph, 21(4), 35-44. doi: 10.1145/37402.37407. Luhta, Eric and Kenny Roy. 2014. How to Cheat in Maya 2014. New York: Focal Press. Marshall, James. 2014. “Agent-Based Modelling of Emotional Goals in Digital Media Design Projects”. International Journal of People-Oriented Programming (IJPOP), 3(1), 44-59. Murdoch, Steven. (Forthcoming). “Agent-Oriented Modelling in the Production of 3D Character Animation”. Studies in Australasian Cinema, (10.1). Parent, Rick, David S. Ebert, David Gould, Markus Gross, Chris Kazmier, Charles John Lumsden, Richard Keiser, Alberto Menache, Matthias Müller and F Kenton Musgrave. 2009. Computer Animation Complete: All-In-One: Learn Motion Capture, Characteristic, Point-Based, and Maya Winning Techniques. Burlington, Mass: Morgan Kaufmann. Schleifer, Jason. 2011. Animator Friendly Rigging: Animation Quality vs. Quantity – What about Quality?! [Blog] May 17. Accessed April 25 2012. http://jasonschleifer.com/2011/05/17/animation-quality-vs-quantity-what-about-quality/. Selby, Andrew. 2013. Animation. London: Laurence King Publishing. Sterling, Leon and Kuldar Taveter. 2009. The Art of Agent-oriented Modeling, Intelligent robotics and autonomous agents. Cambridge, Mass: The MIT Press. Thomas, Frank, and Ollie Johnston. 1995. The Illusion of Life: Disney Animation. 1st Hyperion edition ed. New York: Hyperion. Williams, Richard. 2001. The Animator’s Survival Kit-Revised Edition: A Manual of Methods, Principles and Formulas for Classical, Computer, Games, Stop Motion and Internet Animators. London: Faber and Faber Limited.